Fall is officially here which can only mean harvest is upon us! While it is a great time to reap the rewards of your hard work, remember to keep your eyes on all the details down the homestretch. Monitor your crop conditions, check stalk and plant durability every few days as it can change particularly quickly during cool, wet fall weather. Harvest at ideal moisture levels, while you might think it’s cheaper to let your crops dry in the field it is proven that this is not the case – especially in organics. Ideal harvest moisture for corn and soybeans are 24% and 14%, respectively. You can certainly air-dry soybeans to the desired moisture; however, corn requires a sufficient amount of heat to dry it down (note: if you are growing food grade be careful with your drying process as stress can result in kernel cracks). Ultimately, harvesting with some moisture will result in considerably less harvest loss and field shrink. Doublecheck combine settings, make absolutely certain you are not losing grain out the back of your combine. If you are, get a technician to help you with adjustments. Want to check? Once you have your combine set perfectly, stop, raise your chopper, and windrow everything out the back for about 50 feet. It will allow you to examine everything coming through your machine in a condensed area. It only takes 10 minutes and will provide a significant reward if you need to make any final adjustments. Make sure everything is clean. It is critical to ensure that contamination does not occur so please follow the guidelines on clean-outs, border segregation, labeling, and inspections in great detail. Make sure bins, combine, semis, wagons, grain carts, augers, and anything else that will touch your crop are clean of any foreign material. This is the only way to ensure your grain will not be contaminated. If custom work is being performed for your harvest, make sure each operator/owner signs an affidavit. Treat your bins with OMRI approved products, if needed. If you have any kind of weevil or bug infestation make sure to treat your bin with approved OMRI grain products, such diatomaceous earth, to eliminate the pest (please check with your Account Executive or certifier prior to product application). Storing grain for more than 60 days? If so, core your bins within 14 days from filling to remove any hotspots and ensure proper airflow. Please contact your Account Executive if you have any questions or concerns. Everyone at AgriSecure hopes the above tips help you have a successful and profitable fall harvest. Markets are transitioning out of old crop and into new crop with the commencement of harvest. Unfortunately, northwest Iowa and southwest Minnesota are ending the farming season just as it started …extremely wet. In fact, areas in the region received over 8.5” of rainfall in a matter of two days. Conversely, Nebraska has seen very favorable conditions including a stretch of 6 days with some areas receiving near ideal drying temperatures of over 90 degrees. 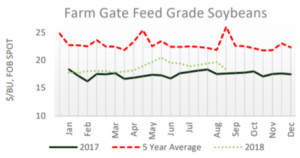 Overall, the 2018 organic harvest conditions are leaning towards extremely favorable. As a result, prices are softer right at harvest with new crop feed grade yellow corn being $.025 – $0.75 lower than current old crop values. The current outlook projects premiums for holding onto your grain longer – the trajectory is usually incremental. 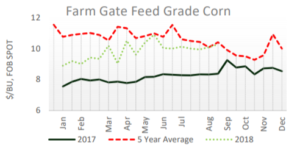 Current forecasts are pointing towards a $0.15 – $0.35 premium for yellow feed grade corn in January (vs. October), with even higher premiums as we reach late spring / early summer selling windows. FSA Reimbursement Program: The Farm Service Agency (FSA) offers a reimbursement of up to $750.00 to assist with expenses having to do with certification / inspection. Stop in to your local FSA office with your receipts and your certificate to fill out the reimbursement necessary paperwork.